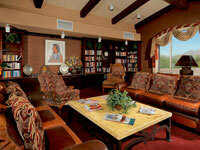 Scottsdale Retirement Communities is a true community in every way. Staff and residents share more than casual camaraderie; there's a sense that we're all part of the same family. We look out for one another and work side by side on resident committees to ensure our community reflects common values and traditions. Residents are always eager to give of their time and talents. Along with building and fixing furniture in our on-site woodworking shop, using our art studio to make quilts for various charities, and sponsoring a scholarship program for Scottsdale Retirement Communities staff, they stay involved in the local community volunteering at museums, galleries and hospitals.